I am setting up a new tank and wanted to check with your expertise before I proceed - hope you don’t mind! I have now set up a new 150l. I want to put in medium-large-ish puffers. One shop has in 4 twin spotted puffers (8-10cm) which I understand are nearly fully grown (probably two thirds of their full size). The shop have had them in for a few months in a tiny tank and therefore feel like it would be good to take them. Water quality - I have a good external filter with 11-12x flow rate per hour. I plan to do twice weekly water changes (15-20%) but probably do 3-4 times weekly in the first few weeks. The shop is apparently feeding them twice a day on bloodworms/mussels/prawns (I’d probably throw in a cray fish or crab on occasion for their beaks). This sounds like a lot of food though maybe it should be reduced to once a day but that may increase aggression? Aggression - the shop have had them in for a few months and there has been no aggression between them. I know these are generally aggressive but if they have been fine with each other for now then I don’t see that this should change. Plus a group of 4 means aggression will be spread. Swimming space - no issue as these are more of a ‘lurker’ fish. Not quite as inactive as a humpback but nothing like some of the active puffers. I've emailed you in the past and have always been pleased with the knowledge you have, so you're my last stop. I've asked some different puffer groups and no one seems to be able to help, or want to help (I'm not sure). Anyway, here's my issue. I kept a Suvattii puffer in a 30-gallon tank for 3 years. Then in late March I found that he'd developed some fungus on his body and near his mouth (but I don't think it was exclusively mouth fungus, which I know can be different). Anyway, when I've had issues with fungus in the past, I've used Melafix and/or Pimafix and always had good results. I'm wary of using chemicals on my puffers, especially as that particular tank is planted with live plants. Anyway, after a few days, my Suvattii puffer died, the fungus had penetrated too far, and I'd caught it too late I'm guessing. Well, I bought a couple of crabs and since I didn't want to move them into a planted tank, knowing that most crabs will shred plants. So I moved my Abei puffer into the tank the Suvattii had been in, and moved the crabs where the Abei had been. The Abei was in that tank from about the 28th of March until yesterday. least 11 years, and have about 9 different species at the moment with no problems with any of the others. It's something with this tank. <Possibly. There's certainly an argument for giving the tank a big clean. So, here I am with a nice big planted tank ... that clearly has some issue. I don't want to put any other living thing in there until I know what's going on OR how to sanitize the tank so that it won't hurt any other fish or aquatic living thing. I am hoping you can help me out here. I'd really like to stay away from anything that may kill the live plants in the tank because I started out with just a couple plants to now having quite a few plants and it looking very nice. Just to say, when the first puffer got fungus I did check the temperature of the tank, which was a bit high, so I adjusted the thermometer and now it's where it should be. I clean the tank at regular intervals and it's got a good powerful filter in there. The only thing of course was finding uneaten food among the plants (each time with both puffers). Also, and I'm not sure this matters, but that tank gets a fair amount of light from a window, though not enough to produce algae, so not sure if that matters or not. I'm really hoping you can help me with this. That tank is a nice size and while I have 13 other tanks, they are all happily occupied and I'd like to keep this tank and be able to use it. But I don't want to put anything in there until I can figure out what the issue is, because I don't want to kill any more fish, especially my puffer fish. Thank you so kindly Neale for taking the time to reply to my query. I do have a couple of additional questions now. How many 90% water changes should I do? And I'm guessing that after I'm done those, then I should do the CupriSorb? And how long after all of that should I wait before adding aquatic life? Also, for future references, what is a good "medicine" for puffers with fungal problems? I haven't had any for years until the Suvattii got it, and while I've always had good results with the Pima and Melafix .... I respect and trust your experience, so would definitely try anything you think would work better. Again, thank you ever so much for taking the time to help me here. I really didn't know who to turn to, as I don't trust internet information much these days. Oh, and how do you feel about using Koi clay in puffer tanks? Yeah or Nay? It was something suggested to me, but I really know nothing about using such a thing. A big "Thank you" to WetWebMedia and Neale Monks for helping me. Excellent advice and very much appreciated. Wanted to make a quick enquiry. I've kept three red eye puffers for a few years in a mixed community with success. I would now like to move them into a 40gal biotope based on Borneo/Sumatra. What would be your recommended fish for this setup? <Ah now, Fishbase says this: "Specimens typically caught along bank vegetation in large rivers. The specimen from Sambas were obtained amongst submerged bank vegetation. The water was murky brown, with pH about 6.0. My puffers have never bothered the Kuhli loaches or garra in with them. I'd like bottom dwellers and fast shoalers. Also how might you decorate the tank? I've been looking at ideas but am keen to hear your expertise. So I've got this bare 20 gallon tall tank and am wanting to try my hand at a different type of puffer. So would a single Auriglobus modestus (true freshwater species) be a happy specimen in a 20 tall that will be HEAVILY planted? I notice the 20 tall inst ideal as a 20 long would be but my stand wouldn't hold that long of a tank... As for food I have a 10 gallon as well that will be housing one of those self cloning crayfish that I've heard makes copies of itself like crazy along with snails in the tank so there would be lots of live food to watch this aggressive puffer munch on as well as frozen foods that will be trying to be fed as well. Basically my concern is it starting to pace the glass and become stressed, but I would think having the tank being extremely forested and jungle Val completely covering 3 out of the 4 glass panes along with the driftwood and live food should keep him entertained and happy. If not please let me know! Any advice appreciated! (not a total new comer to puffers, I've had dp's successfully before and done rigorous research on almost all fw puffer species). Thanks again Neale for the information! I think I might have already asked this, but just to reiterate, are there any other freshwater puffer species that would be suitable for a planted 20 gallon tall tank, possibly putting the dwarf puffers aside? But if not do you have any other general recommendations for this size tank as far as stocking goes (I've found that the dimensions of my tank are just really odd in general) ...as I am just not sure of what to keep in this tank haha.. so any recommendations would be greatly appreciated! obviously there's always the dwarf Indian puffer which I'm well versed with..but I'm looking for something that grows a tad larger...but is still manageable in my 20 gallon..
And I'm pretty sure Amazon puffers are out of the equation with a tank my size... (being they prefer groups)....or would they be a suitable choice? Thanks Neale! Always a pleasure to get responses from you! Going back to the Auriglobus modestus, even though they may be aggressive, do they come with personalities as with some of the larger fish such as Oscars (equally intelligent if not more?) and other puffers? I've allays liked their greenish sheen, and also do they end to hide when young or older? Even with it all planted and their line of sight distracted from one another is there room for more? (personally I thought the 1 per 5 gallons is suitable, but depends on conditions correct?) '¦. And thanks for suggesting the Carinotetraodon irrubesco as I was also considering them as well (just wasn't 100% sure a 20 gallon would suffice for a pair)! I looked through the information about changing the gravel in an aquarium on this site and others, but I don't feel as if I have enough information to proceed. I have a cycled (but recently cycled) 10 gallon aquarium with 3 good-sized bunches of Hygrophila difformis (Water wisteria) along with one largish lava rock, a small lava rock covered by Hemianthus micranthemoides (Baby tears), a small Buddha figurine, and plans to get some wood (real or fake). I have an Aqueon 5-15 filter with a sponge in it for biological filtration bacteria. 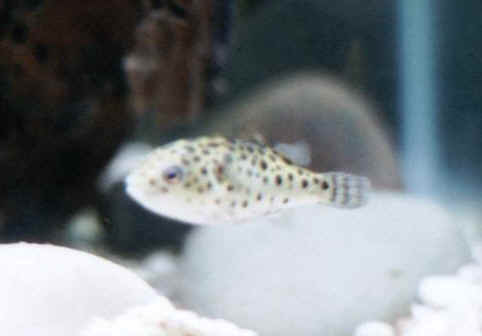 In the tank I just put in my new baby dwarf puffer (female I think) that I shall name Penelope. She is about Â¾ of an inch long. My water right now is pretty well perfect (0 Ammonia, 0 nitrite, 5 ppm nitrate) and I plan on weekly 25 to 30% water changes to keep it that way. My question is, can I in a week or two to allow the puffer to acclimate to its new home (or longer if you guys think that is better), change the gravel? I want to go to more of a biotope setting and I picked out some pretty tacky gravel originally (oops). Given the plants, the biological filtration sponge, and the rocks, will there be enough bacteria to prevent a mini or complete cycle? I know puffers don't survive the cycling process, so I want to avoid this. I also plan on keeping bags of the old gravel in stockings with the new gravel to help with colonization of the bacteria, but I want to make sure all of this is enough so I don't hurt my puffer. Thanks for all your help. Your information is quite helpful, especially about the puffers. Unfortunately I didn't really get to find too much information on them before I made my purchase and I would like to know if I can keep this puffer since I'll real soon be adding salt to my tank to make it more brackish conditions for my GSP? Will she be able to survive these conditions because I really want to keep this fish, I've never seen it anywhere else and they had it named as a Ninja Puffer so it was difficult to identify the actual species, Carinotetraodon irrubesco. Everywhere I've looked they are under freshwater but I am hoping that they will be able to thrive in the low salinity water. FW Dwarf Puffers in a BW Tank 2/11/07 Hi guys! I love your site, thank you so much for having the awesome info! <Thanks Michelle, Pufferpunk here tonight.> Ok, let me first say that yes, I did read all the articles & FAQ's I could before dropping you this e-m. Perhaps I missed something? <We try but not every detail of fishkeeping is in there.> Anyway, I have had a brackish tank (39 gal) for about 2 months now. I have one F8 puffer, 3 Dwarf puffers and 3 Bumble Bee Gobies. <Dwarf puffers are not BW fish.> My tank has 8 plants in it, a crush coral/gravel substrate, two small clay pots (cleaned thoroughly before placement), the bottom of one of pots is balanced between the two creating a cave as well, and finally, a large hollowed out conch shell. <Sounds OK so far.> My numbers are as follows: salinity: .005, <You mean specific gravity of 1.005?> ammonia :0, Nitrates: 20 -40, <Nitrates should be below 20.> Nitrites: 0, PH: 7.6, <pH is best kept at around 8. How much crushed coral is in there? It should keep the pH higher than that.> Hardness: 50 & Alkalinity: 120. I do 15 -25% water changes every week. I feed them krill or krill w/Spirulina twice a day (a half a frozen block, also feed on a schedule) and fresh snails 3-4 times a week. Water temp is 82-84. <A bit on the high side. Aim a bit lower, 78-80. For feeding ideas: http://www.thepufferforum.com/forum/library/feeding/feeding-your-puffers/ > I have an Emperor 280 (LFS said it should take care of bio-load). And I just replaced my tank light bulb with a full spectrum florescent. Alrighty, with all that said... My dwarves are not nearly as colorful as the pictures I've seen on your site and others, though they act "normally", I think they are still juveniles. Any idea's? <I killed my 1st dwarves by keeping them in BW (before I knew better). These are strictly FW fish.> Second, my F8 is very, very, shy and won't let me look at him unless we are feeding, even then he runs. He spends most of his time swimming up and down the corner of the tank where the heater is. <He may be frightened by the much more aggressive dwarf puffers. Depending on how long you've had him, he may also still be adjusting to his surroundings. See if he acts differently, when you remove the dwarves.> And his mouth appears in the last three weeks to have turned dark. His color is also faded. Now, I have read up on this as much as I could. I read that the "black chin" could be from too high Nitrites, so I got the test kit, did water changes, etc.. and got them to 0. My LFS said perhaps the salinity is too low, so I brought it up from .004 to .005. <1.005 is perfect.> He seems to eat normally but I am worried. I don't understand why he just swims up and down the corner. The shyness I guess could just be his personality.. :( The plants vary in height from smallish Java ferns to a tall Anubis, I have the caves "covered" by Sagittarius grass so he doesn't feel like he's out in the open. Oh he's about 2 inches, so I think he's a juvenile too. <Not really--generally grow to 3".> Do you have any idea's?? I am worried and want to do what's best for my fish. I really like them a lot and hope to have a fish w/live rock some day soon but if I can't take care of these guys properly, I don't want to risk it. <Good of you to start "small" & work your way up to SW. More info on your F8 puffer: http://www.thepufferforum.com/forum/library/puffers-in-focus/f8/ Check out the forum within that website also. ~PP> Thank you for your help and sorry for the long windedness but I want you to know everything. Michelle A.
MBU puffer outgrowing tank >Hi there, >>Greetings, Katy, Marina here. >My beloved MBU Puffer is outgrowing his tank (3ft), he is now about 10 inches long. We are thinking of upgrading the tank one more time to a 5/6 ft one, however, we do realize we won't be able to keep him forever. The Aquatic Center we bought him at would take him back (for a credit note at 1/3 third his worth) but there he would just be sitting in another small tank, and how much longer until he outgrows that?! >>Indeed. For those of you who will soon be reading this, it pays to research. Katy, I will be using this query for 'teaching' on the site. The following may sound quite harsh, but it is intended to educate others only, NOT to admonish you. Get the largest tank you possibly can. 6' minimum, and wide rather than tall. >So, the question is, do you know of someone with a suitable setup to take him on? Private or maybe an Aquarium we can donate him to where he can grow to his full potential and basically live happily ever after? >>Unfortunately, Katy, I personally do not. If there is someone who reads this and they know they can suitably house a 3' long puffer, hopefully they'll let us know. Public aquariums and zoos are absolutely INUNDATED with requests from people wanting them to house their pet fish. It is rare that they can take these animals. I would suggest that you have two options (barring an unexpected, large inheritance): Post your problem on one of the internet aquatic forums, or humanely euthanize the fish. >As you have guessed I am not after selling him. I'd love to return him to his natural habitat, but can't quite afford it. >>This practice cannot be discouraged enough. There are many reasons why, but I'll give you two that I think are good enough. First, as a captive fish, the puffer has been exposed to pathogens that may not be present in his "native" habitat. Returning him there could ultimately be disastrous to that environment as a whole. Second, as a captive fish, he is ill-equipped to go into a natural environment and fully compete for food and territory. He could likely be doomed to die, either from inter/intraspecific aggression, predation, or starvation. >Maybe a stronger warning as to how fast and how BIG they grow should be put out! Let's face it, who can accommodate a 3ft fish? >>What is more in order is to remind people to *research* BEFORE they make a purchase. Actually, I find I cannot emphasize this enough. I do hope, when you're in your LFS, that you remind others that they would do well to research. >According to [the establishment] where we bought ours, we should have been able to keep him for years before he became too big. Right! >>Ultimately the responsibility lies with the person who decided to purchase an animal they knew they couldn't house for life. Since it seems you knew the animal would become so large that you wouldn't be able to house it, I don't quite see the difference between sooner vs. later. >>If, however, the difference is that you expected to have time to acquire/create better housing for the animal, then I would pose that you may still have some time, you're getting a larger tank as it is and may be able to milk it for all it's worth. I would also suggest slimming his feeding, just a bit, to see if that helps to curtail his growth rate. It seems that you may be TOO good at what you're doing! Please understand that I really don't mean to be harsh, but because this will be posted on the Daily FAQ's I feel it's very, very important for others to read this and learn, before they go and make a similar mistake. According to the information on our site, this puffer reaches to just a bit over 2'. So, you might be able to house him and keep him to his old age. http://www.wetwebmedia.com/BrackishSubWebIndex/fwbracpuffers.htm >Many thanks, Katy <-- just wanting to do right by him >>Best of luck to you and the puffer. Try as I've suggested, and hopefully your pet can live out his years with his original owner. Marina <-- keeping her fingers crossed for you both!